This fall has felt very un-fall to me. 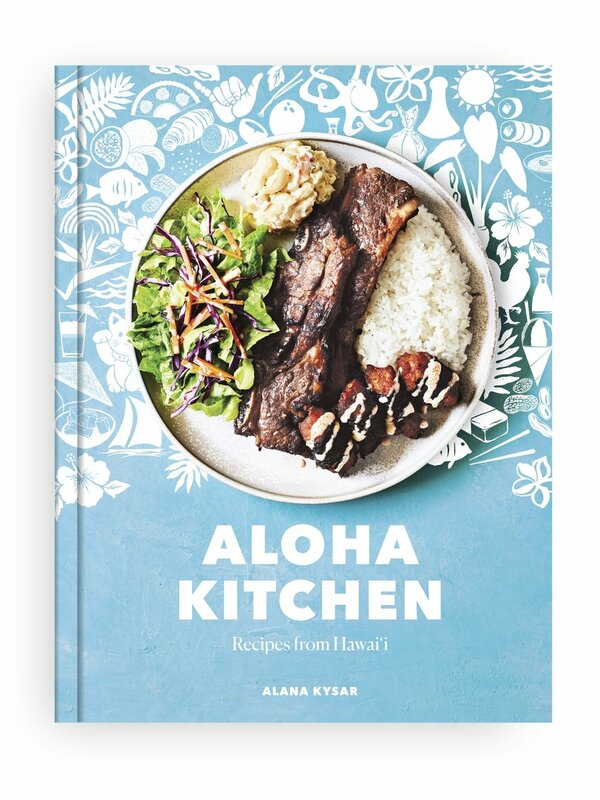 I've been tinkering away in the kitchen to make the perfect mac salad, the ultimate pickled mango, and the best maki sushi in town (#cookbooklife) instead of focusing on the stars of autumn, fall produce. Fruits like persimmon and pomegranate have yet to make their way through our door, and yet, no matter what I'm doing or working on, apples (and pears) have been the exception to the no fall in this household rule. I've been slathering apple slices in peanut butter, pairing them with mini cheddar cheese wheels, and grabbing them whole for on the go ventures. However, I've yet to bake with them, that is until I made these baked apple cider donuts with maple glaze and cinnamon crumbles. If you're an apple cider donut purist, look away right now! These donuts are not for you. They are decidedly not your typical apple cider donut. They're light, moist, and buttery instead of dense and *err* *maybe* a bit dry. They are glazed and topped with a quick cinnamon crumble versus the traditional cinnamon sugar coating. And there are real apple chunks inside the donut because that's exactly what this doctor (me) ordered! 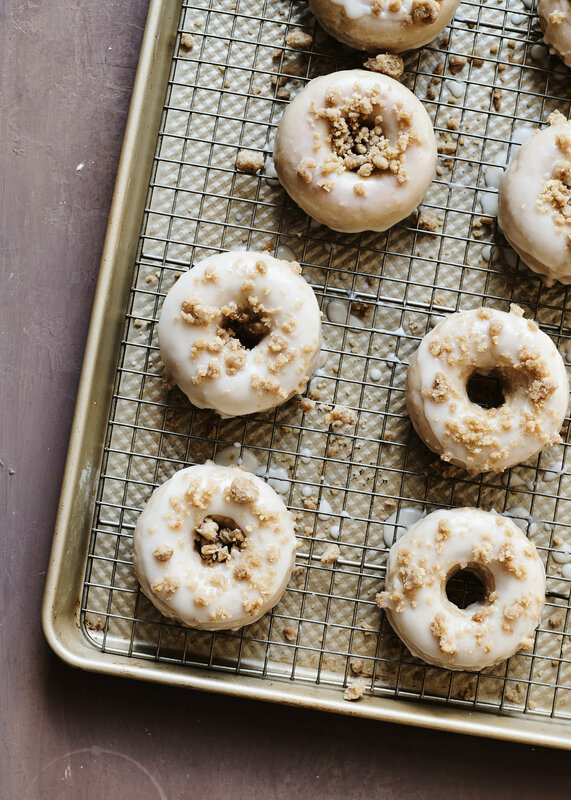 When I set out to make these donuts, I was craving a "cake" donut not a "cake donut", meaning a moist "cake" shaped like a donut not a dry, dense "cake donut", so think about pulling out a fork and knife when eating these. A bit about the process, because in my opinion it's a fun one. 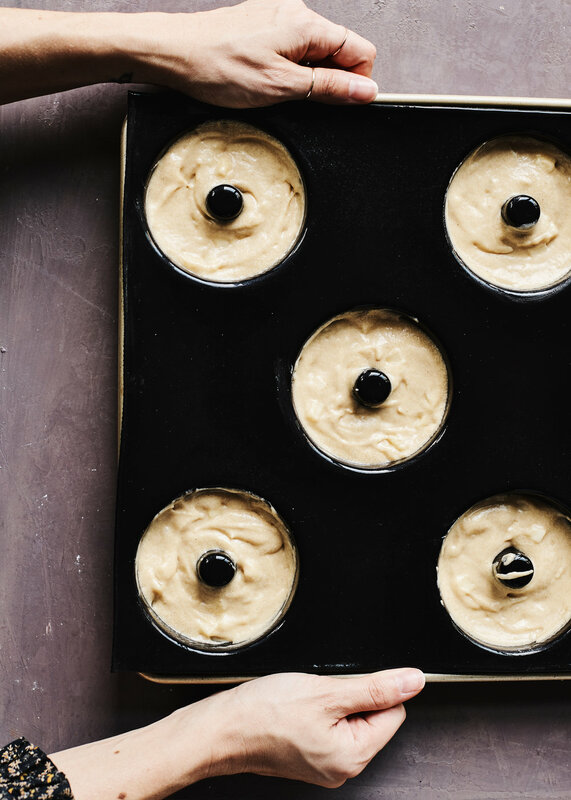 You can whip these donuts up in two bowls and if you're feeling really analog, you can use a whisk instead of a hand-held mixer. I'd recommend throwing them in a piping bag or a large Ziploc bag (with the end snipped off) to pipe them in with ease. I baked mine up in a Flexipan Donut Pan Mold, which was epic because the mold doesn't require any oiling and the molds made for the perfect donut shape! Once the baked donuts cooled, they popped right out of the mold, it was insanely cool and way easy. And if you're a baking nerd, here's why all that stuff is possible: the molds are made of a unique fiberglass mesh and highest quality food grade silicone combination making them non-stick, highly durable, and super flexible. And the mats, well they last for at least 2,000 baking cycles, which means you've got a lot of apple cider donuts in your future, I mean if you want. And if you get tired of apple cider donuts, you can move on to savory everything bagel donuts! And now, back to cookbooking. After all, somebody's gotta figure out the best way to teach you how to make saimin at home right? Preheat the oven to 350°F. Set a rack in the middle of the oven. In a small pot, bring the apple cider to a rolling boil and boil for 6 minutes or until reduced by half. Combine the eggs, sugars, and creme fraiche in a large mixing bowl and mix with a handheld mixer on medium-low until fully combined. Alternately, you can mix together with a whisk. In a medium mixing bowl, whisk together the flour, baking powder, salt, cinnamon, and nutmeg. Add the dry ingredients to the wet, in two or three parts, mixing until just combined. You may still see a bit of flour, and that's ok! Add the reduced apple cider and the melted butter and mix until just combined. Fold in the apples then transfer the batter to a piping bag. Pipe each donut cavity halfway full and bake in the oven for 20 minutes. Let the donuts cool to room temperature in the mold before removing. 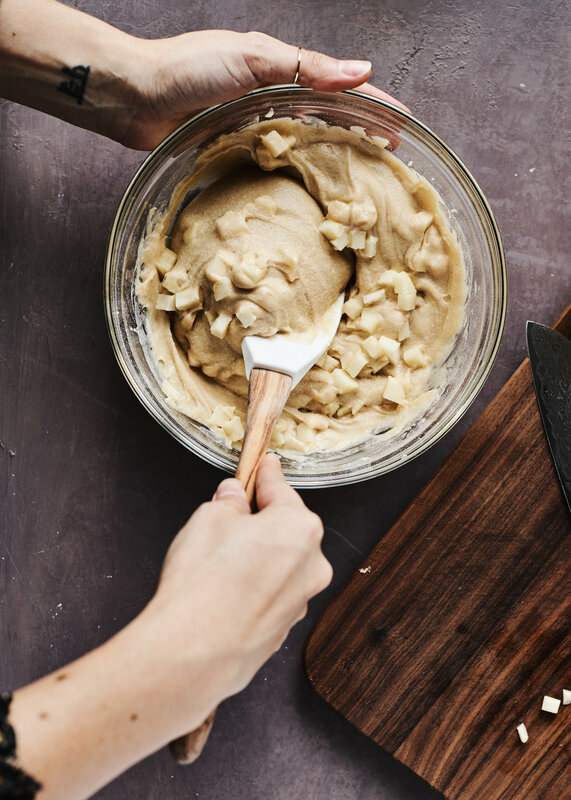 Whisk the first four ingredients together in a bowl, then add the butter pieces. Use your hands to work in the butter pieces, forming small clumps. The mixture will look a bit dry, but fine. Bake in your preheated oven (at 350°F) for 15 minutes. Let cool. In a small pot, melt the butter with the maple syrup on medium heat. As soon as the butter has melted, remove from the heat and whisk in the sifted powdered sugar. Dip the donuts in, top side down, and set on a rack over a baking sheet. Top with cinnamon crumble. Serve and enjoy! This post was sponsored by Pastry Chef's Boutique. I used the Flexipan Donut Pan Mold sold in their shop to create these baked donuts! It's the first time I ever baked with one of these molds, and I'm hooked! Thanks so much for supporting the brands who make this blog possible!